The sitter's grand-niece and heir, Henrietta Ramage Liston Foulis [d. 1850], Millburn Tower, County Edinburgh, Scotland; her son, Sir James Liston Foulis, 9th baronet [1847-1895], Woodhall and Millburn Tower, County Edinburgh; his son, Sir William Liston Foulis, 10th baronet [1869-1918], Woodhall and Millburn Tower, County Edinburgh; (P. & D. Colnaghi & Obach, London, on joint account with M. Knoedler & Co., New York), 16 December 1919; sold April 1920 to Elbert H. Gary [1846-1927], New York; sale of his estate (American Art Association, New York, 8 December 1934, no. 385); bought by Chester Dale [1883-1962], New York; gift 1960 to NGA. After Miss Liston married Sir William Foulis, 8th Baronet (1812-1858) in 1843, he assumed the name Liston. On the baronetcy see George Edward Cokayne, Complete Baronetage, 6 vols., Exeter, England, 1900-1909, 2 (1902):401-403, and Burke's Genealogical and Heraldic History of the Peerage, Baronetage and Knightage, 105th ed., London, 1970, 1043-1044. Melissa De Medeiros, librarian, M. Knoedler & Co, provided information about Knoedler's ownership and subsequent sales in a letter of 5 June 1992 (NGA curatorial file). American Art Association, Important Rugs, Paintings, Georgian Silver and English Furniture from the Estate of the Late Elbert H. Gary and from the Estate of the Late Emma T. Gary, New York, 1934, 78, repro. ; see "When Genuine Raeburns Turn Out to Be Absolute Stuarts," Art Digest 9, no. 5 (1 December 1934), 8, and "Active Bidding Marks Auction of Gary Estate," Art News 33, no. 11 (15 December 1934), 3; on Gary see Dictionary of American Biography, 20 vols., New York, 1928-1936, reprinted in 10 vols. with 8 supplements, New York, 1944-1988, 4:175-176. 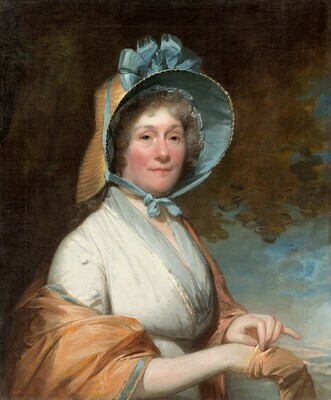 Liston, Mrs. Robert. Correspondence. National Library of Scotland, Edinburgh. Cunningham, Allan. The Life of Sir David Wilkie; with his Journals, Tours, and Critical Remarks on Works of Art; and a Selection from his Correspondence. 3 vols. London, 1843: 2:119. Armstrong, Sir Walter. Sir Henry Raeburn. London, 1901: 106. Pinnington, Edward. Sir Henry Raeburn, R.A.. London, 1904: 238. Greig, James. Sir Henry Raeburn, R.A., London, 1911: 51. Fielding, Mantle. "Addenda and Corrections to Paintings by Gilbert Stuart. Not Noted in Mason's Life of Stuart." Pennsylvania Magazine of History and Biography 44 (January 1920): 89. Park 1926, 480, no. 494, repro. "When Genuine Raeburns Turn Out to be Absolute Gilbert Stuarts." Art Digest 9, no. 5 (1 December 1934): 8. Comstock, Helen. "A Recapitulation of Portraits Recovered for Gilbert Stuart." Connoisseur 95 (February 1935): 99-100, repro. Perkins, Bradford. "A Diplomat's Wife in Philadelphia: Letters of Henrietta Liston, 1796-1800." William and Mary Quarterly 11, no. 4 (January 1954): 592-632, repro. Wright, Esmond. "Robert Liston, Second British Minister to the United States." History Today 11, no. 2 (February 1961): 118-127, repro. Cairns, Huntington, and John Walker, eds., Treasures from the National Gallery of Art, New York, 1962: 136, color repro., as Lady Liston. Walker, John. National Gallery of Art, Washington, D.C. New York, 1963 (reprinted 1964 in French, German, and Spanish): 321, repro., as Lady Liston. Paintings other than French in the Chester Dale Collection. National Gallery of Art, Washington, 1965: 28, repro., as Lady Liston. American Paintings and Sculpture: An Illustrated Catalogue. National Gallery of Art, Washington, 1970: 104, repro., as Lady Liston. Walker, John. National Gallery of Art, Washington. New York, 1975: 382, color repro. Williams, William James. A Heritage of American Paintings from the National Gallery of Art. New York, 1981: repro. 67. Walker, John. National Gallery of Art, Washington. Rev. ed. New York, 1984: 378, no. 532, color repro., as Lady Liston. McLanathan 1986, 99-100, color repro. Miles, Ellen G. American Paintings of the Eighteenth Century. The Collections of the National Gallery of Art Systematic Catalogue. Washington, D.C., 1995: 224-227, color repro. 225.